Thank you so much for posting all of these stitch patterns. 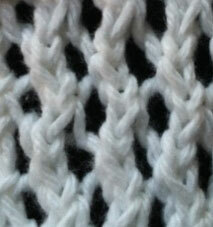 I had a question about this stitch. I was trying to convert it to knitting on the round and and the beginning/end of row 4/3 it gets weird and I can't figure it out. The K1 in Rows 3 and 4 are omitted, and you are going to need to remove the stitch marker in order to work two sts together for the decrease at the end of the round. You should then slip off the stitch just knit from the right needle, replace the stitch marker, then put the stitch back on the right needle. You will be ready to continue with the next round of knitting. Should it still be done on an odd number of stitches? Yes, you still need an odd number of stitches. Thank you so much! I'll post a picture when I finish my project. Hi, thank you so much for this tutorial, its wonderful. Quick question, are the stitches supposed to decrease in number as you go? I started with 27 cast ons, and now it's down to 25...? Thanks for your help in advance! The stitch count should remain constant. Sounds like you may be forgetting a yarn over.